The types of SWAT team weapons and equipment used vary from precinct to precinct. Standard gun models plus extra accessories are used to help accomplish a variety of field missions. One common artillery choice in this category includes AR15s such as M4a1, CQBR, and Colt Commando guns. Different models of Sig Sauers and HKs are also used by SWAT team members. Various models of Benelli (i.e. M1, M4, M1014), Remington (i.e. 870, 1100), and Mossberg (i.e. 500, 590) guns are used. Two models frequently used are the 9mm HK MP5 10mm MP510. SWAT team personnel may also be seen with a .40 / .45 HK UMP or a 5.7mm FN P90. Glock and Sig Sauer 9mm and .40 pistols are used quite often, as are the USPs and Beretta 92F 9mm. Another pistol used quite frequently is the Colt 1911 .45acp. A SWAT team may also use battering rams, halogen tools, ballistic shields, and stun grenades. Tasers, pepper ball guns, flash bang grenades, and tear gas may also be used in certain instances. These items as well as some of the ones mentioned above usually are employed for demotion of doors or breaking locks. Another use is to provide protection by warding off enemies who are in the midst of attack. The exception is the shields, which provide cover. However, another major use of certain minor artillery pieces is to stopping criminals in their tracks. SWAT teams also usually bring alone tactical radios and flexi-cuffs. 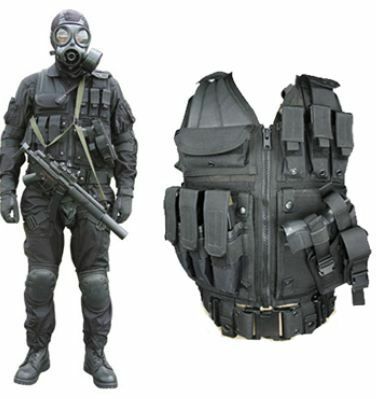 Protective clothing worn by SWAT team members includes body armor, helmet, eye wear, and assault webbing. They also may wear knee pads, gloves, and harnesses, as well as weather-proof tactical pants, shirts, and jackets. Arm bands often are worn as well. SWAT vehicles also provide extra defense, as they are designed with maximum maneuverability in mind. This branch of law enforcement uses Armored Rescued Vehicles (ARVs) specifically for rescue of civilians and officers pinned down by gunfire. SWAT teams also use helicopters, buses, vans, trucks and other vehicles for rescue, and each one has in it the proper equipment for defense against criminals.